Long Bent Rocket (1960) is an early lithograph by Robert Whitman of a rocket moving through the air. Short, staccato lines constitute the body of the rocket, while dense marks extending from either side of the lower shaft suggest fins. The words the long bent rocket, framed by the fins below the length of the rocket, appear backwards—a result of the lithographic process—and long, airy lines surrounding the body of the rocket suggest movement. Whitman surrounded himself with artists who, like him, were working partially in reaction to the work of Abstract Expressionism, which emphasized the direct connection between the hand of the artist and the surface of the work. This focus manifested itself in a wide variety of brushwork and mark-making techniques. 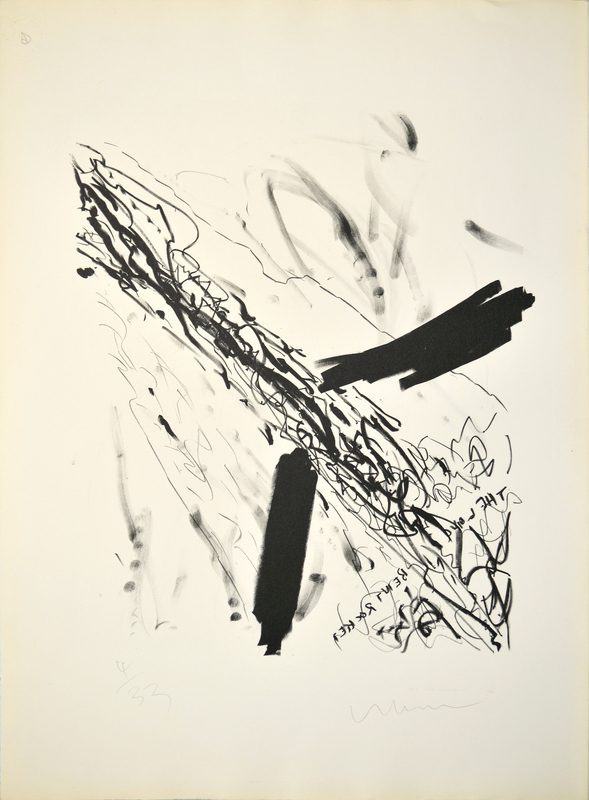 Here, Whitman references the multiplicity of gestural strategies of Abstract Expressionism by making marks with a number of different tools, including lithographic crayons and his fingers. However, lithography is a multi-step process that builds significant distance between the hand of the artist and the finished product, presenting a challenge to Abstract Expressionist formal strategies. Whitman is best known for his theatrical works, which he began making in the early 1960s, blending aspects of performance art and traditional theater with technological innovations involving sound and light. In 1967, along with Robert Rauschenberg, Billy Klüver, and Fred Waldhauer, Whitman founded Experiments in Art and Technology (E.A.T. ), a group focused on bringing new technologies to artists looking to fold new media into their practice. The ongoing Space Race with the U.S.S.R. would have placed space technology at the forefront of American culture at this time, and images of rockets also appear in work by Whitman’s associates, including Rauschenberg’s Untitled (Mirror) (1952). Though Long Bent Rocket antedates the majority of Whitman’s mature oeuvre, we can understand this lithograph as a work through which the artist processed the movement that preceded him, while imagining his own role in formal and conceptual developments to come. Robert Whitman (b. 1935, New York, NY) received a BA in Literature at Rutgers, The State University of New Jersey, New Brunswick (1957), where his first solo exhibition was held in 1958. He studied Art History at Columbia University, New York (1958), and created and staged many of his first “Happenings” performances on the Lower East Side alongside artists like Allan Kaprow, Lucas Samaras, Red Grooms, Jim Dine, and Claes Oldenburg. Whitman co-founded the non-profit organization Experiments in Art and Technology (E.A.T.) (1966) with Billy Klüver, Fred Waldhauer, and Robert Rauschenberg. The most recent traveling retrospective on Whitman’s work opened at Dia:Chelsea, New York (2003). Recent solo exhibitions were held at the Williams Center for the Arts, Lafayette College, Easton, Pennsylvania (2007); PaceWildenstein, New York (2007); Eyebeam Art + Technology Center, New York (2012); and Broadway 1602, New York (2013). Whitman also made several films included in his work, such as Window (1963), Dressing Table (1964), Shower (1964), Sink (1964), and Room (1974). Whitman lives and works in Warwick, New York and is represented by Pace Gallery, New York.